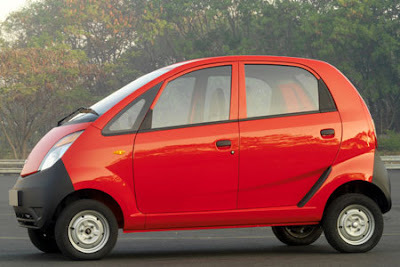 In case you hadn't heard, Tata Motors officially put it's tiny Nano on sale today. With a price of just $2,000 (USD), it's the least expensive new car in the world. That's a big deal, especially in Tata's home market of India, where the vehicle could take away some business from scooter and motorcycle sales. Hey—you can't put four people on a scooter. Fine ... you shouldn't put four people on a scooter. The car is pretty impressive, but not for its driving dynamics, amazing technical features, or performance. It's amazing that Tata was able to produce a vehicle that so many people can afford, and allegedly still make money. It's all very Henry Ford-esque. A car that more people can afford to buy: Brilliant then and now. Anyway, check out both links below—the BBC article is a good read, and the Autoblog link has the full press release and lots-o-pics. And yes, I think I've heard all of the "Tiny Tatas" jokes I can handle for one day. Thanks to Trenton for the tip! I just don't know how they'd sell it in the U.S. w/o airbags (e.g. crash standards). I'm sure there's a way around it. There are plans for an all-electric version, which could be certified in the U.S. as an NEV, governed to 25 (35?) MPH. Very valid points, nlpnt. The all-electric version would not need to meet any crash standards, I believe, so it would be a lot easier to get into the U.S. (much like ZAP's Xebra and other electric vehicles). I would DEFINITELY want a passenger side rearview mirror to drive that thing in Indian urban traffic, though!